I spoke these words into a microphone to help the nurses pronounce it in English at the Prasart Hospital in the province of Surin. To a nurse, there’s nothing funny about laxatives. I had a hard enough time saying it without laughing, but my friend Kale didn’t make it any easier by staring at me with a grin while I tried to articulate every word. As a close neighbor (about 45 minutes away) Melissa Brown asked if I’d assist her, Kale and Zach Rueth at her local hospital. The nurses were very excited to learn some important medical terms in English. Melissa also had Too, an 18-year old guy who spoke very good English, to help translate. We started sitting around a conference table and asking the nurses some common phrases they like to learn in English. One of them was, “This medicine is a laxative.” Melissa would write them on the computer for the nurses – and other staff members – to read on the overhead. Either myself or Kale would then read them aloud through a microphone and everyone would repeat the words. Kale articulates his English the best he can for the nurses. “Please lie down in the bed. You may have stomach pain. There will be a fee of 300 baht. There were about 25 staff members who came to the three-hour session. We learned later that everyone who arrived came under their own will. They were extremely thankful and asked if we’d come back. I may have missed another session last Friday thanks to reconnect training, but I’m hoping to see the ladies at Prasart Hospital again. Note: as of the last few days, the internet at my office has been horrible and I have been unable to access the web the last few days. I’m back on today, but an unable to attach anything to e-mails or blogs. I have a number of stories to tell, but don’t have the internet access to share them at this point. As a spoiled American, I keep asking the staff what’s wrong with the internet and all I get in response is “I don’t know.” Where this problem would be solved by the end of the day in the states, I really don’t know when it will be here. Be patient and stay tuned! 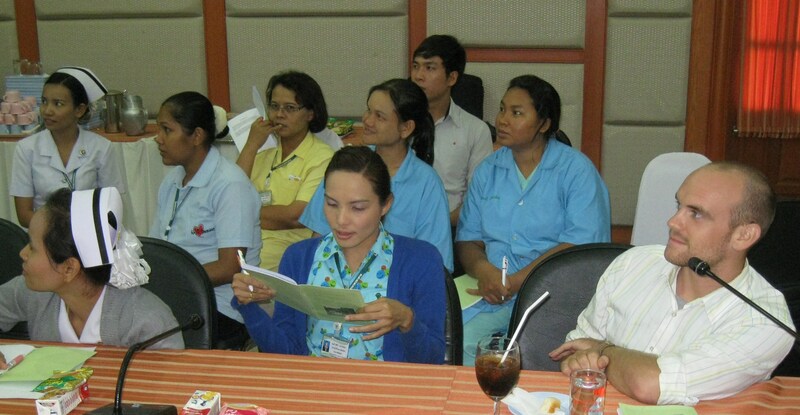 This entry was posted in Peace Corps and tagged nurses, peace corps, thailand by Jeff Jackson. Bookmark the permalink.